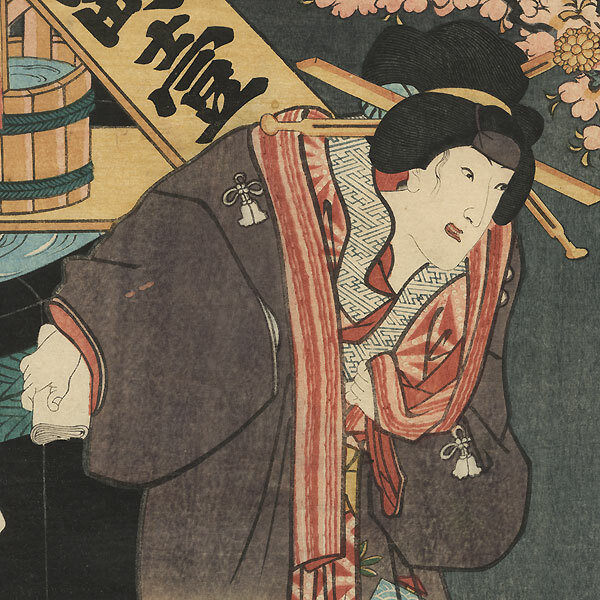 Comments - Interesting portrait of a beauty standing in the street beside a large display in case of fire of a tub of water topped with a pyramid of buckets. She leans forward with a happily grin, a roll of tissues in one hand and the other clutching the edge of her outer robe. 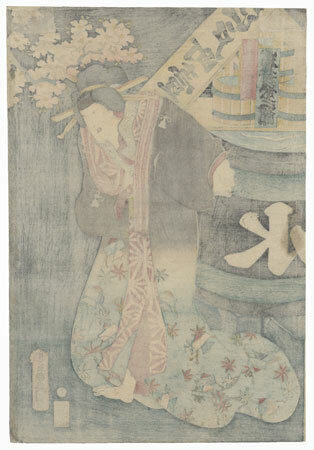 Her kimono is shaded from violet to blue-green bordered with maples leaves and toy balancing dolls. A blossoming cherry tree frames the night sky at upper right. An attractive design, nicely detailed. Image Size - 12 1/2" x 9 1/4"
Condition - This print with excellent detail as shown. Remnants of paper hinge mounts on reverse at top corners. Slight toning and soiling, stain. Please see photos for details.